Diy, thrifty home decor decorating ideas on a budget. Painting furniture, stenciling projects. Turning trash to treasure. Calling all you creative geniuses..yes I am talking to YOU! My husband is the ebayer of the house. I really never gander on there too much. Mike knows what he wants and knows exactly what to look for. Well the other day I decided I wanted some grain sacks. My FIL has some he is giving us in a few weeks, but me being the impatient person that I am.....I decided to get some of my own. For $7.00 a piece, I had not much to lose. this is what I got. What the heck am I going to do with these? I love the colors, I love that they are from Columbia, they smell like coffee too. However, they are really, really stiff, and hard. They almost feel like nylon grain sacks, if that makes sense. Moral of the story...NO more ebay for me. But what can I do with them? Did I mention they are very large? Help with some ideas, I would love to use them. Remember, I don't pick these top three, Mr. Linky does! He shows me the most viewed posts. You never know what catches one eye, and what I am finding out through this feature, is that it truly is different every week. This week in no particular order..
How cute is her dining area? I know I would definitely head on over to check it out. There hard work sure paid off! If I blabbed about you, feel free to grab my blab button. read all about it here! Color, texture, stay or go? So much fun it was indeed. I am not one into table cloths. At one time, I loved them, and lace ones no less. Now I like table runners and placemats. Of course, as you know color is key for me. Now that I finally have valances I like, it is hard to find the right table runner to go with, or should I say compliment. even though my birthday is over. I don't shop that much these days..too busy on this dang computer. How about this score for 12.99 at Marshalls, including the bottles...I almost walked away from it, then I thought, I know what I can do with it. I love my faux flowers and apples from PIER I..that is the only place I like to get the faux's. These are the same colors in the valances. I think it is a nice compliment..paisley and check? Sure why not..
As you can see I did not place this table cloth the traditional way. I layered it on each side. It just looked too perfect the other way, I hate perfect. I still have to iron it, because I HATE wrinkles too..
but before I took that time to do that, I have to see if I can live it with it. It's OFFICIAL, We we were published! 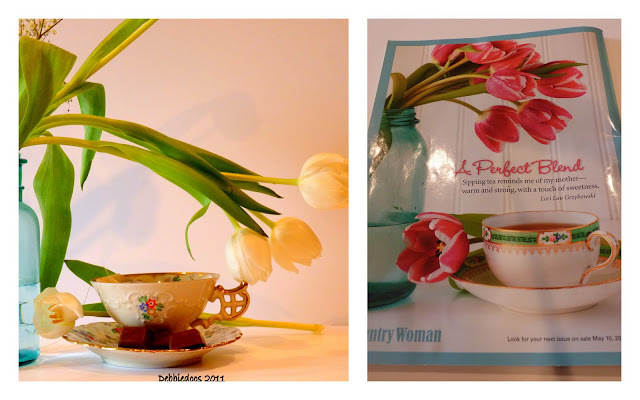 Of course, I have been busting at the seams to share our experience with our publication in Country Woman magazine! I could not be more pleased on their presentation, and representation of our home and family! with paint, or a thrifty goodwill find, as featured in their publication. I would love if you ran out and bought a copy today. However, it does not hit newsstands until July 12th. If you are a subscriber to Country Woman, you will see it sometime this week. Let me just say, it is fabulous in large, glossy print. I just can't believe it is our house in a magazine. What I will share with you today are some behind the scenes shots. I spent two weeks non- stop, day and night cleaning everything from top to bottom. If there is one bit of advise I can give anyone, that would be...DON'T bother killing yourself cleaning. The way they stage, move things around and do the shots, were so unforeseen to me. Like one little vignette shot they worked on for an hour. This crew was FUN! We all had a wonderful chemistry, and great energy together. Mike even made them lunch and they sat at the pub and ate and chatted. The crew: Richard Lee Johnson (photo's) in the red shoes, Elizabeth Demos photo stylist, and Heather Hawkins Hair and makeup. They sure brought a lot of fresh flowers that I got to keep! Thank you Country Woman Magazine for this wonderful opportunity. I have said it before, and I will say it again. You never know who is spying your blog. 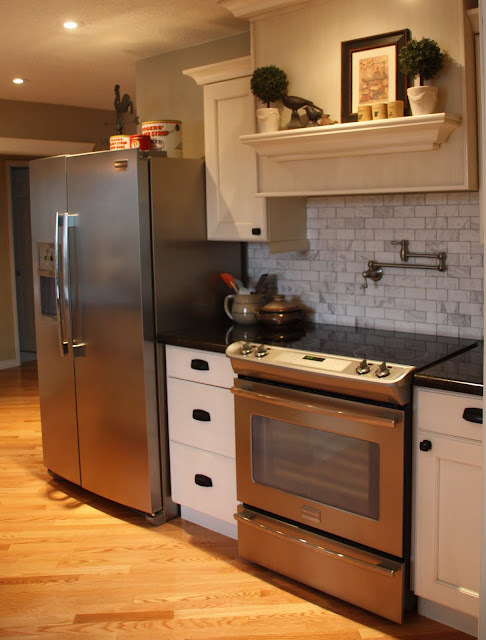 The editor told me she stumbled upon mine while looking for Holiday kitchens. "In search of my Mother's garden, I found my own." I found it on the web, and it spoke volumes to me! This was an extremely fun project. well you can see what I came up with. Right now I am claiming this to be the most enjoyable project, I have ever done. And to think, it all started with a copy cat magazine challenge. I am extremely visual, so when I see something, I can copy it pretty well. I never ever do it exactly though. I guess that is not really copying then is it? These are two wood planks braced together, you have NO idea how heavy it is. But being the stubborn person I am, I stained it, and then carried it to my back porch myself. Of course, with my own fun twist. If you missed my Mom's garden's go HERE! The magazine used coffee cans. I used veggie cans. The larger tin, was pink, I spray painted it,and used my stencil to perk it up. And here is my magazine copy cat. I best get busy on another one for this Coming Friday's party. See you here July 1st for the challenge. In the meantime, let's get the newbie party started. Blogging 6 months or less/ and/or less than 100 followers. Please link back to me, with my button or a link is fine. If you are not a friend/reader of mine, sure would love to have you. I started the newbie party early, as It will be ending early this week. Instead of Wednesday at midnight, it will be Tuesday at Midnight. Reason being, I have the copy cat Magazine party coming up Friday. But oh so true it is. I receive emails on a daily basis, thanking me for the newbie party start. Many feel it was how they even started to grow their blog and actually make friends, and put themselves out there. Yesterday I received one of the most touching emails. Thanks Debbie, I just want to say thank you so much for hosting the newbie party. I'm to old now to participate lol, but if it were not for your help I wouldn't be close to 200 followers. Joining the newbie party gave me the confidence to reach out more to other bloggers and to join more parties. Not an easy feat for a shy introvert like me. I enjoy your blog and look forward to your post. Your warm and bubbly personality always shines through.If I had one wish for the blog world my wish would be that all bloggers no matter how big they are would remember from whence they came and be as warm friendly and as giving as you. 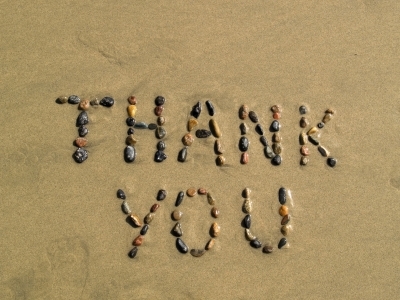 I hope to follow in your foot steps an acknowledge every blogger who takes the time to read and follow my blog. Have a great weekend, and thanks again from the bottom of my heart. Thank you Karen!~ It really made my day, as do all your wonderful emails. I can't reply and comment to all of you as much as I would like. But do know, I read them, and really appreciate your kindness just back to me. Have a great day, and see you tomorrow night for the newbie party. So what has the newbie party done for you? Old and new bloggers, I would love to hear about it. Be here or be SQUARE! I certainly do not Have any square friends. Do you even have a clue? I started first thing this morning working on my Magazine copy cat challenge! A challenge it is. Remember you can put your own personal twist on your copy, however it has to be accompanied by the magazine inspiration. Any guesses on what I am doing?? Mike is working again...Tonight we are going to our local Carolina ski show, and the rest of the weekend, I think I will clean, cook and chauffeur the kids. 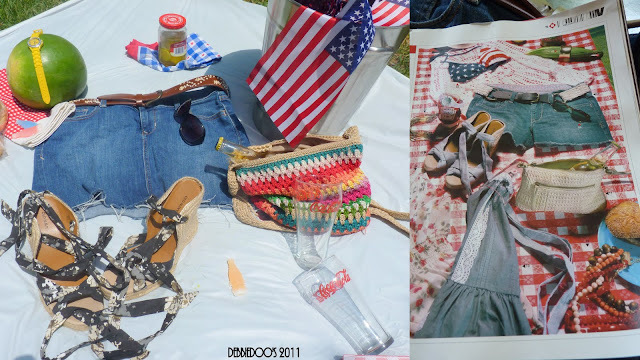 I can't believe how much you girls happened to really like the idea of a magazine copy cat linky party! In fact, according to my stats that has been the most viewed post this week. I must be onto something! I just said to my husband the other day, I really need some new innovative ideas. Hoping he would help me, because Mike is really clever like that. In fact, he helped me come up with the Newbie linky party idea. COOL BEANS! !~ we all need our niche' and I have found mine. Obviously, a hodge podge of stuff! I like to have fun, and I bring that to you too. It's nice to have a hubby who supports me, and inspires me to be the best that I can be. It can be from any magazine of your choice. It can be from a craft magazine, Food magazine,etc... which will challenge you to actually MAKE the craft, and COOK. YOU must take a picture of the magazine image though, that is the point, and the fun of this challenge. You may mix it up some and put your own twist on it of course. However, I really want it to be as mirror imaged like as possible. As you can see from mine, I added some delicious chocolates to the tea saucer. Other than that it was pretty spot on. I will give us time on this challenge. It is not as easy as you think. Be creative, have fun!. Don't go out and buy a new sofa for pete sakes! I am betting most of us have a lot around the house that we can use. How about we shoot for...JULY 1st I host this challenge? Is that enough time? I picked up a magazine yesterday, and I have enough challenges for at least 3 times. So I plan on continuing this on my own, and if it goes well here, perhaps I will continue it as a party too. 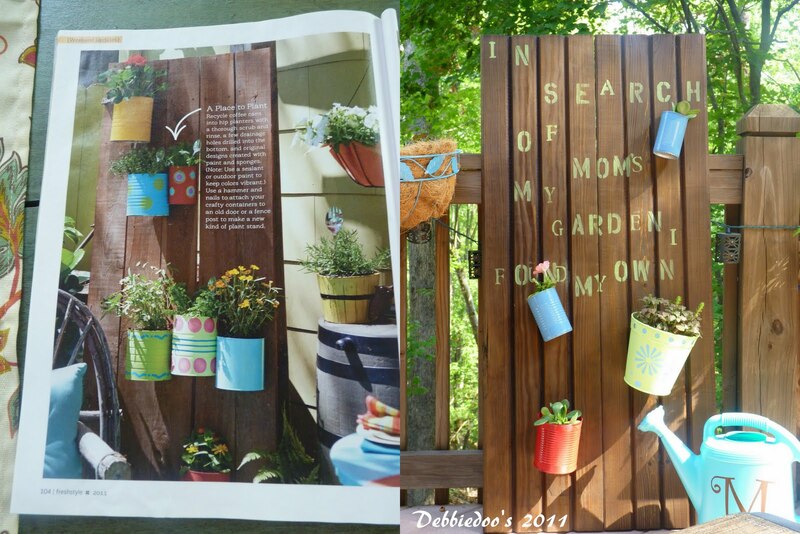 As you can see, I used different color flowers, however the same premise of the magazine picture above. 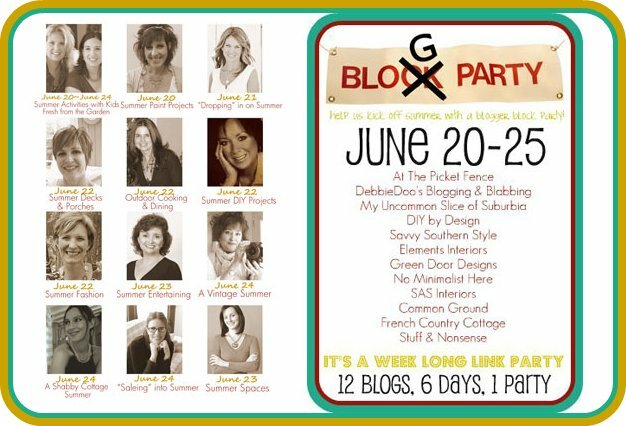 Hey gals don't forget the BLOG party is still going ON...here is the line up for the next few days left! Genes are a funny thing. Sometimes you get passed down some good traits, sometimes NOT. However, gardening was not ONE of them. My Grandmother was a wonderful gardener as well. Let me share how my Mom's gardens grow. I can't wait to see them in a few weeks. My Mom and step Dad downsized to a town house around 5 years ago. Their property out in the Country was sprawling with Gardens....My Mom has made her little town house pretty sprawling too. This is leading to the back deck area. My hostas NEVER looked like this. You see those little garden peeps? She painted them all last summer. There is her pretty little garden girl, hence her name on the web. For those of you that she used to visit frequently, NOW you know where she has been. Look at these roses...I wonder if she spray painted that little arbor? My Mom is very into little details, and such cute ones. This is on her front porch. Every nook and cranny is so cute to look at. Welcome to Linda's home and gardens. Thanks so much for stopping by. If you are in the NYS region, and have any questions on birds or flowers, I am certain my Mom could help you. Just pop me an email and I will forward it to her. Debbiedoo's home and garden. I share all things thrifty craft ideas, seasonal budget friendly ideas from the dollar tree and a recipe or two. You can also see my new stencil line sold on Amazon.Just type in the search bar Debbiedoo's stencils. Spring clean up in 10 minutes!